Can Twilio Inc. Weather a Market Downturn? Will this volatile stock sink or swim during a market downturn? With the market hovering near a historic high, cautious investors might be wondering how their stocks will fare during the inevitable market downturn. Generally speaking, strong companies bounce back like rubber balls, while weak ones crack like eggs. However, some stocks have already gone through huge rallies and declines even without major market downturns. One such stock is Twilio (NYSE:TWLO) -- which surged from its IPO price of $15 to nearly $70 within three months last year, but subsequently tumbled back to the upper $30s. This raises an interesting question -- if Twilio was already so volatile during a bull market, what would a bear market do to the stock? To find the answer, we should examine three key factors that will come into play if the bear bites. Like many other high-growth cloud companies, Twilio posts robust revenue growth which doesn't trickle down to GAAP profitability. That's because developing new services boosts R&D expenses, securing new customers requires high marketing expenses, and intense competition has flattened price expectations for SaaS (software as a service) providers. In 2016, Twilio's GAAP operating loss widened from $35.4 million a year ago to $41.3 million. Its GAAP net loss per share narrowed from $2.19 to $0.78 during that period, but only because its IPO and secondary offering tripled its share count. Twilio also hasn't offered any long-term roadmap toward achieving profitability. A lack of profits is often acceptable during bull markets, but it becomes a big liability during market downturns because there's no P/E ratio to act as a fundamental safety net. Meanwhile, Twilio's P/S ratio of 10 is more than double the industry average for software companies -- which means that it could easily be cut in half before it's considered "cheap" relative to its sales growth. Twilio has traded publicly for less than a year, so there's no record of its prior performance during market downturns. 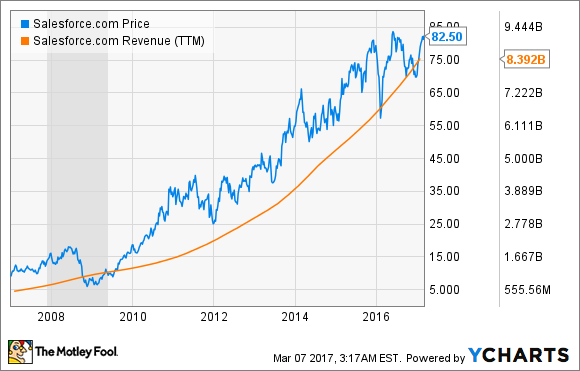 But to get an idea of what might happen, we can examine another cloud SaaS company with similar growth characteristics -- Salesforce.com (NYSE:CRM). 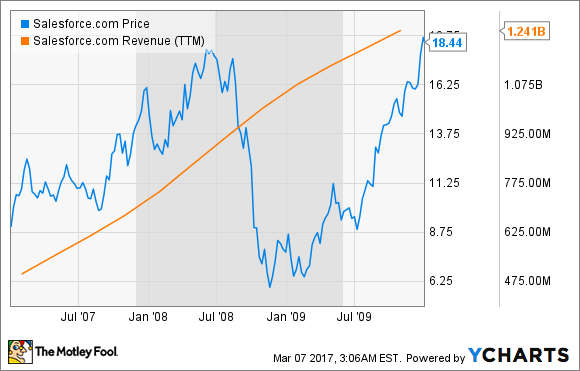 This following chart shows what happened to Salesforce's revenue and stock price before, during, and after the financial crisis of 2007-2008. Salesforce's annual sales growth fell from 60% (fiscal 2007) and 21% (fiscal 2010) during that period. That slowdown seemed steep, but Salesforce's top line growth started accelerating again after those storm clouds passed, maintaining an annual growth rate of over 35% between 2012 and 2015 before slowing down slightly to the mid-20s. That growth was attributed to growing demand for its CRM (customer relationship management) services and an aggressive inorganic growth strategy. If we stretch out Salesforce's chart to today, we'll notice that it would have been a costly mistake to sell the stock during the financial crisis -- although its valuations were high (about 11 times sales prior to the crash) and its profitability was inconsistent. There's no guarantee that Twilio will rebound like Salesforce and surge to new highs, but Twilio's revenue will likely continue growing through recessions as long as mobile apps require cloud-based integration for voice calls, messages, videos, and other features. Twilio's growing dependence on enterprise customers could become a liability during a recession, but Salesforce's recovery indicates that demand for cloud services can bounce back quickly. 3. How stable is Twilio's cash flow? Investors may forgive a few quarters of slowing sales growth, but negative cash flows can be tougher to address -- especially for younger tech companies like Twilio. Much of Twilio's cash comes from its IPO, which raised $172.5 million and boosted its cash and equivalents to $261.4 million during the second quarter of 2016. That position dipped to $252.2 million in the third quarter. During the fourth quarter, Twilio sold a secondary offering of seven million shares (about 641,000 shares unloaded by Twilio) at $40 -- which generated $25.6 million in proceeds and helped Twilio finish the year with $305.7 million in cash and equivalents -- up from $108.9 million at the end of 2015 (prior to its IPO). This indicates that Twilio's cash flow is positive, and it's better equipped to weather market downturns than high-growth companies with negative cash flows. However, investors should note that Twilio may use additional share offerings to boost its cash flows if its growth slows down -- which will dilute existing shares and inflate its lofty valuations. So can Twilio weather a market downturn? It's tough to tell if Twilio can bounce back from a market downturn, due to its limited track record as a public company, its lofty valuations, and its lack of profitability. However, analysts likely said similar things about Salesforce in the early days after its IPO in 2004, and that stock subsequently delivered a 2,900% return for those early investors. Therefore, investors should worry less about Twilio's durability during a downturn, and more on the expansion of its ecosystem. If Twilio scales up and maintains its current sales growth rate of more than 30% over the next few years (as analysts expect), it might eventually become profitable and deliver multi-bagger returns for patient investors over the next few years.